Pure Evoke-1S review | What Hi-Fi? 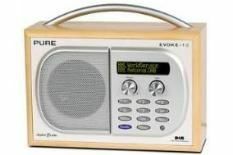 Here's another spin on Pure's original Evoke-1 portable radio, but this one really is portable thanks to the option of using it with the company's £30 ChargePak rechargeable battery, which gives 24 hours' playback per charge. That's not all: this version also has a USB input, a 3.5mm auxiliary input and headphone output, and like past Evokes can be used with an add-on speaker to turn this mono set into a stereo radio. It also has some very green technology: in standby, it uses less than one watt of power, the display is a super-clear OLED that requires no backlighting, and the packaging is mostly made of recycled materials. But it's the sound that clinched the Evoke-1S yet another Award for Pure: smooth and articulate, and very spacious for a mono design, it has greater poise and clarity than any direct rival.